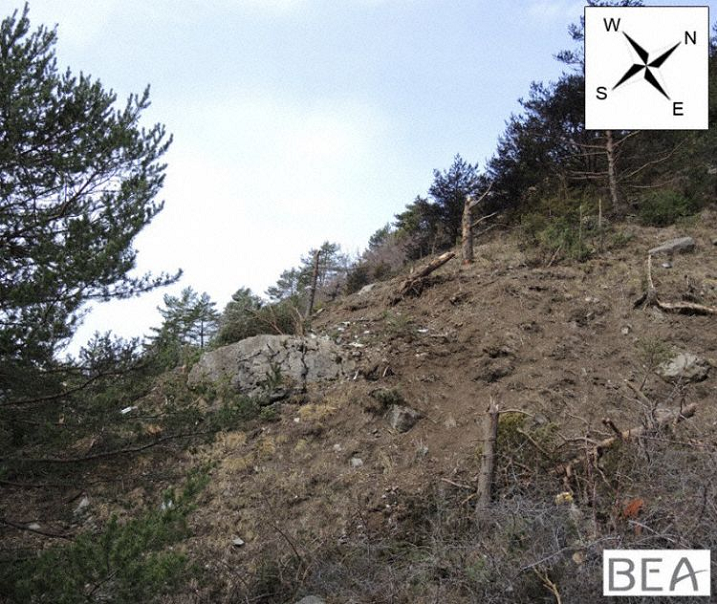 2016-03-13 BEA released the final investigation report. 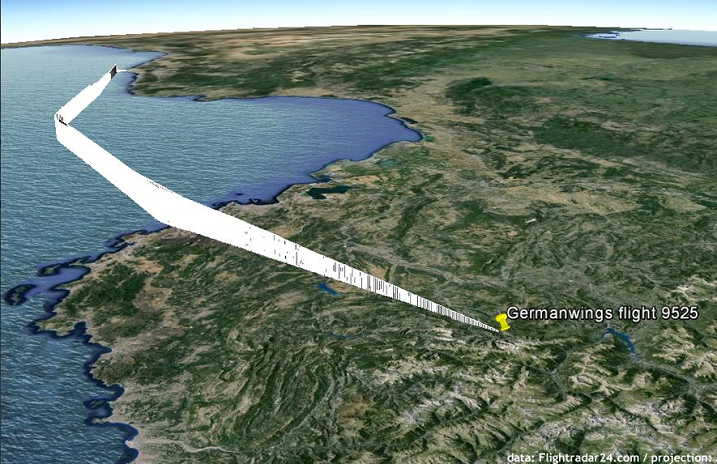 The Airbus A320 was in cruiseflight at 38.000 feet flying along airway UN853 when radar shows a rapid descent until it went off the screens at 6000 feet. 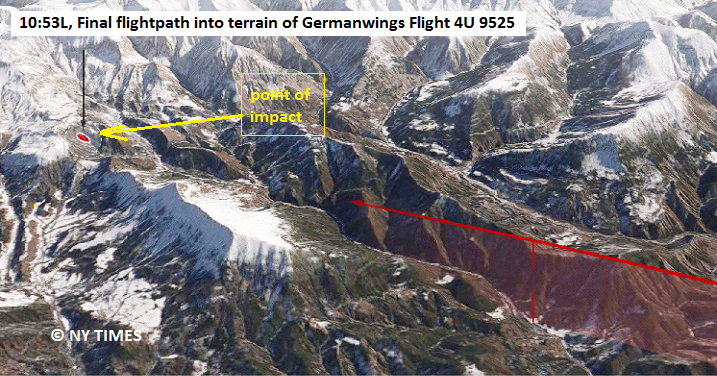 Germanwings scheduled flight 4U 9525 (GWI18G) from Barcelona to Dusseldorf proceeded from point SOSUR via ROTIS – ADITA – MAXIR to LUSOL (see map) before its further flight abruptly discontinued. 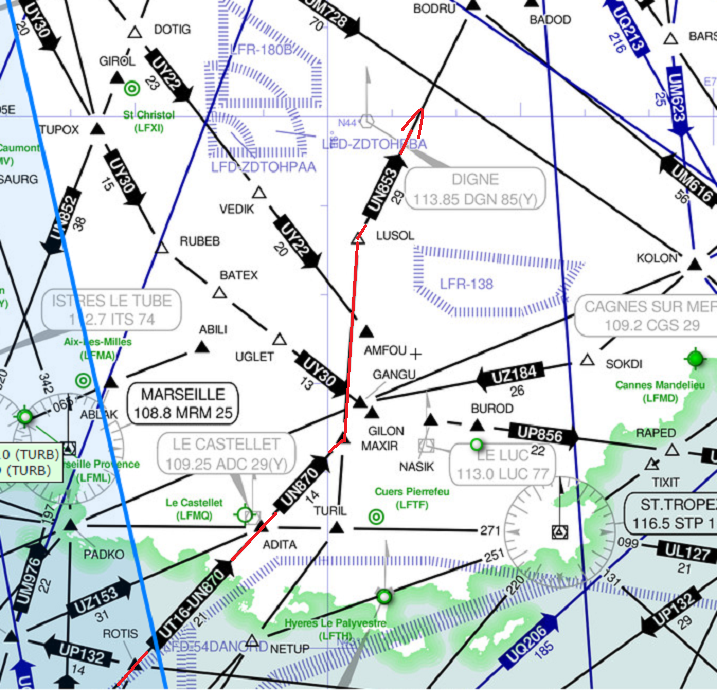 The aircraft took off from runway 07R at Barcelona El Prat International Airport at 10:01L, followed upper airway UN870 over the Mediterranean Sea until it reached its final cruise level of 38000 feet at 10:35L . 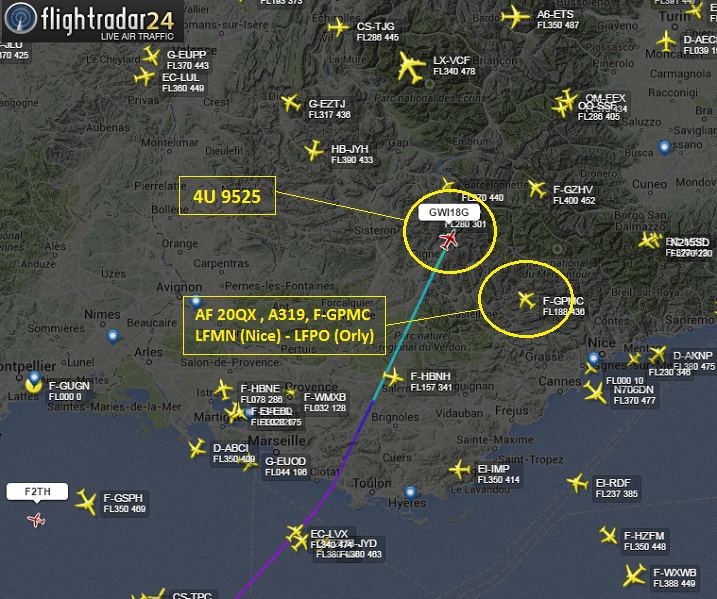 At this time the A320 was flying with about 470 knots (ADSB-measured airspeed) about 15 NM southwest of Toulon, France. 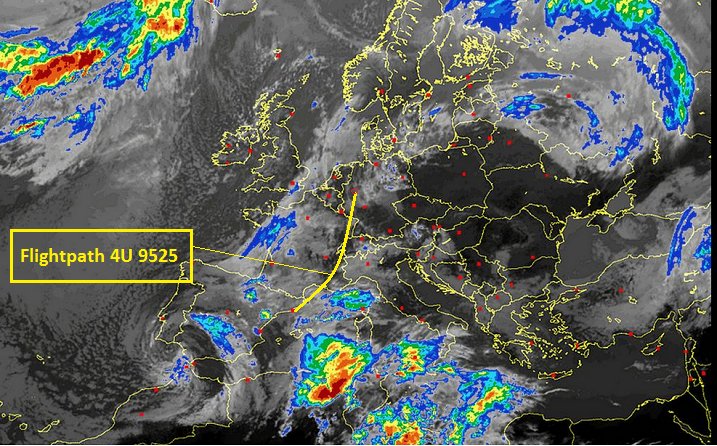 Only one minute later it began a gradual descent until 10:53L when all radar contact was lost. 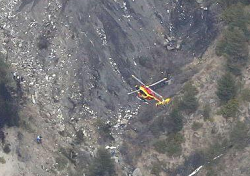 The wreckage was later found by two french police helicopters in mountainous terrain near the town of Barcelonette in southern France. 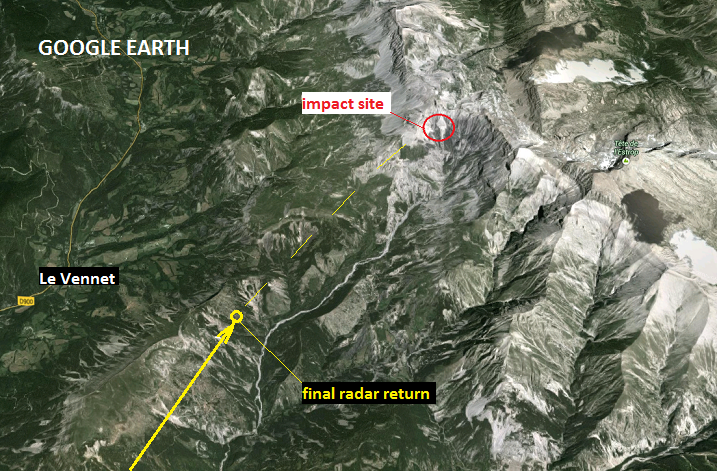 Impact site is situated on steep mountain slopes at an altitude of 5488 feet (1670 m). 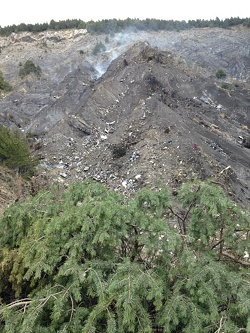 According to Germanwings, the aircraft underwent its last routine check through LH maintenance yesterday, 23rd of MAR. The last C-Check was in summer 2013. 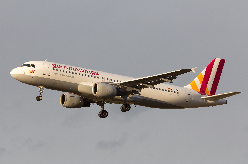 The captain was over 10 years with Germanwings and got 6.763 hours flight experience 3.811 hours on Airbus a320 aircraft, 259 hours as pilot in command. The copilot (27) has 919 total flying hours, 540 of them on Airbus A320 aircraft. 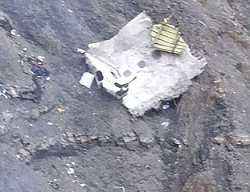 On MAR 26th, the french state attorney reported that there was only the co-pilot in the cockpit in the final phase of flight. 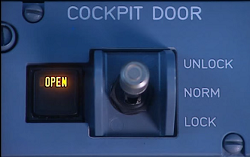 The captain has left the cockpit earlier for the toilet immediately after the flight reached its cruise altitude. 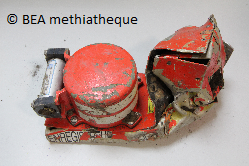 The captain – or any other person from inside the cabin – had no chance to gain access because the cockpit door remained in locked position from inside. 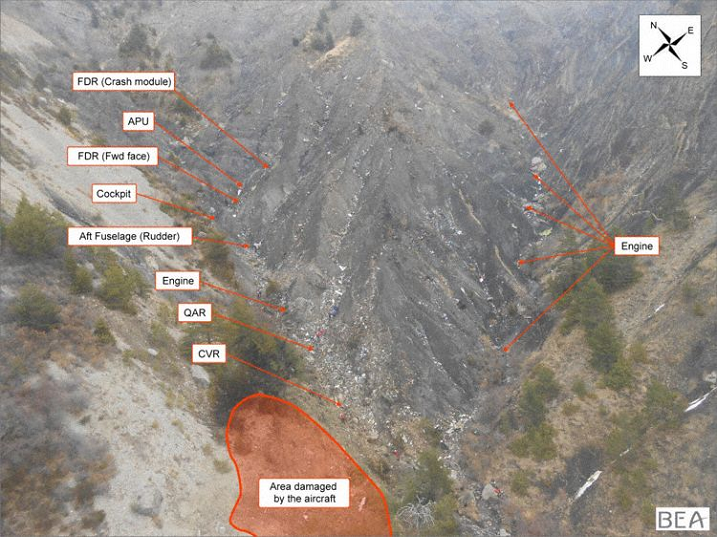 In the investigation process, the experts gained sufficient evidence to believe the co-pilot acted in deliberately, most likely to commit suicide. 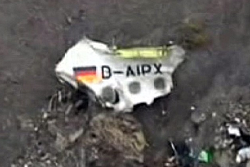 On MAR 27th, it was known by german state attorney, that the co-pilot was in psychological treatment. Apparently he suffered from depression, a fact he concealed from his employer. On May 6th the french BEA published a preliminary report confirming the presumtion of an unlawful interference. 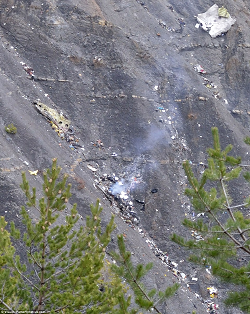 26 seconds after the pilot-in-command left the cockpit, the co-pilot changed the target altitude in the flight control unit from 38.000 ft. to only 100 ft. and selected the „Open Descent Mode“. 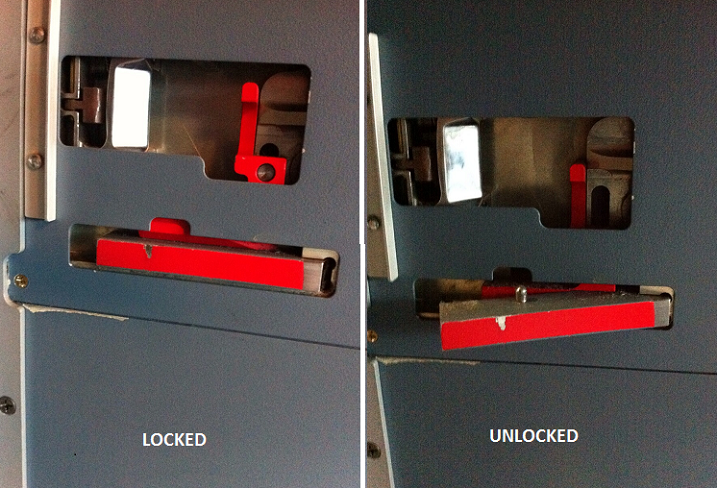 This configuration was maintained until impact 10 minuters and 12 seconds later. 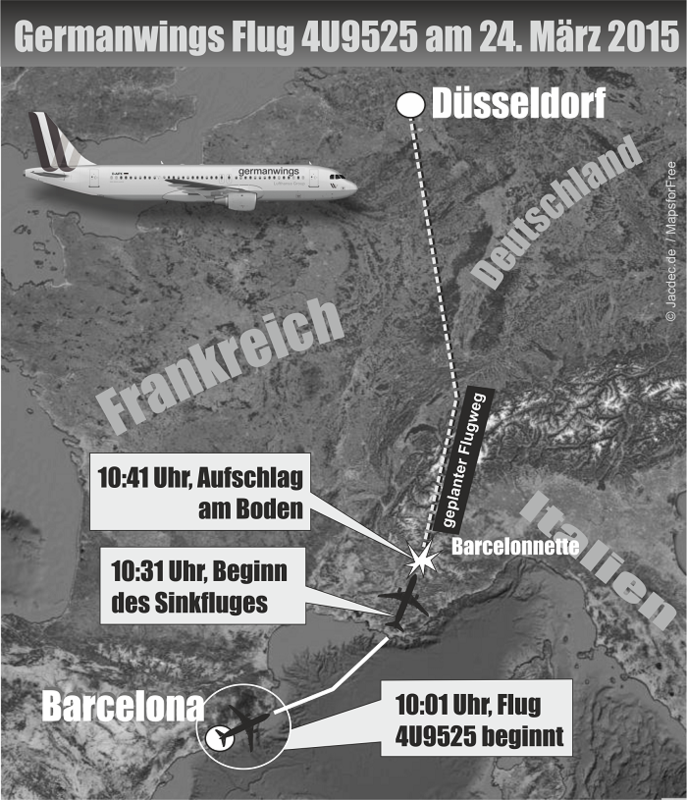 The BEA also analysed the previous flight from Dusseldorf to Barcelona during which the co-pilot needlessly changed the autopilot altitude setting to 100 feet when the captain was out of the cockpit. He quickly restored the cleared flight level again after a few seconds.